Corn flea beetle winter survival is expected to be low in northern Indiana. 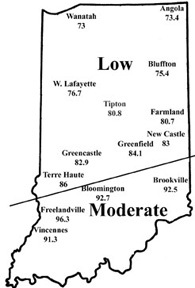 Moderate survival is expected for southern Indiana. Snow cover in February may have protected some overwintering beetles. 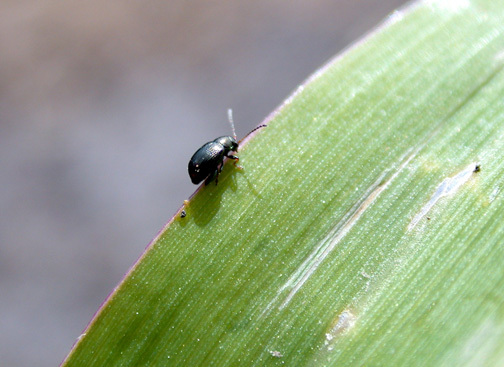 Corn flea beetle is a vector of Stewart’s wilt of corn. Management guidelines are given below. Corn flea beetle is a sporadic pest in Indiana. Winter temperatures in regions where beetles were abundant last season will determine if there is cause to be concerned this season. This is especially important since this insect transmits the bacterium that causes Stewart’s disease in corn. The severity of the disease correlates well with winter temperatures because the organism survives in the gut of the overwintering beetles. Warmer temperatures result in higher beetle survival, and therefore a greater potential for Stewart’s disease. To determine the potential severity of Stewart’s disease, add the average daily temperatures for the months of December, January, and February. If the sum is below 90, the potential for disease problems to develop is low. If between 90 and 100, moderate disease activity is a possibility. Sums above 100 indicate a high probability that severe problems will develop for susceptible corn. To help you better gauge the potential for corn flea beetle activity in your area (and the potential severity of the threat of the disease), we have created the state map shown below. 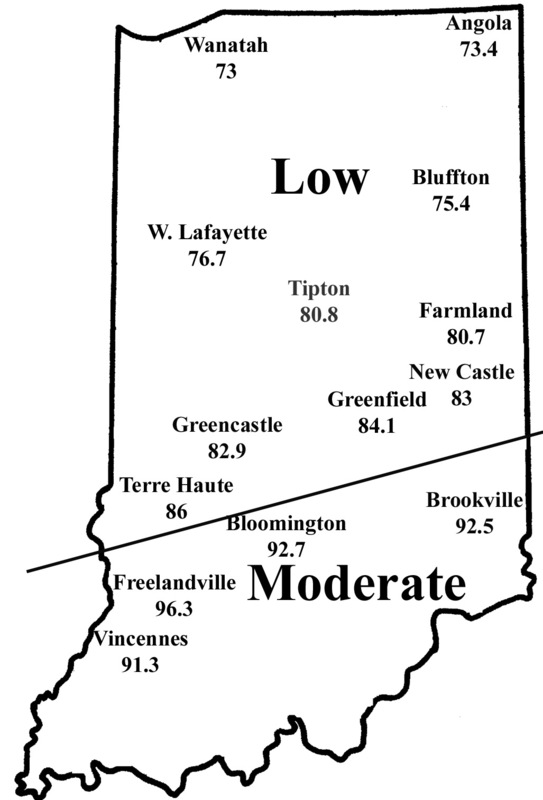 According to the temperature model, there is low probability of corn flea beetle activity and subsequent disease in northern Indiana, and moderate activity in areas south of Interstate-70. This temperature model for corn flea beetle has been in use for many years and has been fairly accurate in predicting the activity of this pest the following spring. However one inherent flaw is that the model is based on ambient air temperatures, not temperatures under leaf litter and grass clumps where this pest is actually overwintering. If snow cover is present, this provides an insulating blanket for the insect, and may protect some beetles from winterkill. Even with this “disclaimer” statement, we think the 2007/2008 winter was cold enough to have negatively impacted overwintering beetles in most of Indiana. Also, flea beetle numbers have been low statewide, in general, for the last couple years. As for the disease, there are two phases of Stewart’s disease: a wilt phase and a leaf blight phase. In the wilt phase, plants wilt rapidly, usually at an early stage of growth. Leaves emerging from the whorl of infected plants are often the first to wilt. Internal tissues at the growing point are discolored or hollowed out. Faint green to yellow streaks containing corn flea beetle feeding marks are visible on one or more leaves. If stalks of wilted plants are cut, it may be possible to see yellow, moist beads of bacterial ooze. Sweet corn hybrids are especially susceptible. Some dent corn inbreds, and occasional dent corn hybrids, and some popcorn lines are susceptible as well. Dent corn hybrids rarely wilt after growth stage V5. The leaf blight phase can occur at any time during the growing season, but often does not appear until after tasseling. Lesions are long and narrow, with pale green to yellow streaks and irregular or wavy-margins. Streaked areas die and become straw-colored. Severely infected leaves may die prematurely. 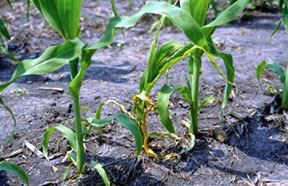 Lesions on leaves of older plants may be confused with northern corn leaf blight. One way to differentiate the two is that it is usually possible to see beetle feeding tracks in Stewart’s disease lesions. Management decisions made now should be based on the corn’s susceptibility to the disease and anticipated risk. Low susceptibility/risk - pest managers should scout fields and apply a foliar rescue treatment after emergence if (1) beetle feeding damage becomes severe, (2) there are 5 or more beetles per plant, and (3) seedlings are growing slowly (e.g., cool temperatures). High susceptibility/risk - sample field edges and in-field areas of grass weed residue (i.e., overwintering sites) before planting to assess overwintering beetle survival and potential beetle movement to emerging corn plants. A sweep net is an ideal sampling tool for this pest. If any beetles are discovered at this time, an at-planting insecticide application is warranted. Most of the corn seed currently sold in Indiana is already protected from corn flea beetle at the time of purchase: Cruiser and Poncho insecticide-treated seed are systemic insecticides that should give good control of flea beetle in the early seedling stage. The low rates of the seed treatments are expected to provide protection from emergence to 2-leaf corn, whereas the higher (rootworm) rate should protect corn through the 5th leaf stage. If insecticide-treated seed is not an option, foliar insecticides broadcasted at the time when corn spikes should provide 7 to 10 days of residual protection from beetle feeding. CAUTION: treating of field edges and waterways for beetle control may be an off label application. Avoid movement of insecticides, including soil-bound materials into aquatic environments. After 3 years as the Field Crops Entomologist here at Purdue University, I have decided to leave Purdue and accept a faculty position with the University of Guelph in Ontario, Canada. This area is where my wife and I grew up, so, more than anything, this was a decision made on the basis of family. It was not an easy choice - Purdue has been good to me, I have enjoyed my time here, learned a lot, and made some lifelong friends. I enjoyed working with and meeting many of you, and it’s been fun to do the job with such a progressive and inquisitive group. In fact, these interactions helped me develop many of my ideas and directions for research and extension so thank you for that, and the best in the future. 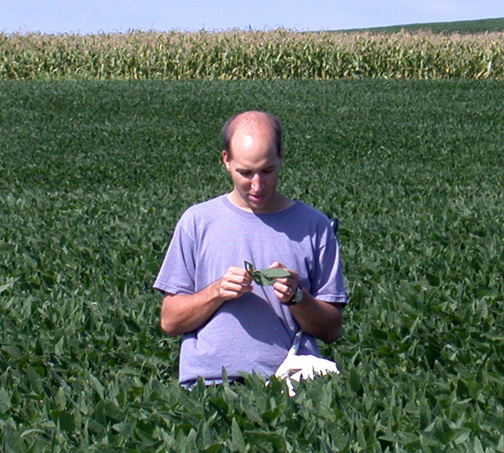 Editor’s note: A search to replace the Extension Field Crops Entomologist has begun. A posting for this position can be viewed at <http://www.entm.purdue.edu/employment/fieldcrops.html>. Until this position has been filled, please direct field crop insect questions to John Obermeyer, 765-494-4563, obe@purdue.edu. In Indiana, spring can be unpredictable and in some situations an early planted corn field is met by cold wet weather resulting in a poor stand. When this happens, cleaning up the existing stand of corn is required before replanting. In the past couple of years the problem of controlling Roundup Ready corn has complicated a corn replant situation. The use of graminicides to clean up the volunteer corn before replanting corn has been difficult due to crop rotation restrictions for these herbicides. Valent has received new supplemental labeling for use of Select Max on field corn. Select Max can be used only in a replant situation. Apply up to 6 fl. oz./A no sooner than 6 days before replanting. Add NIS at 0.25% and 2.5 to 4 lb./A AMS. Do not use MSO or COC. Apply to corn that is 12 inches or less. Avoid overlapping the boom for overlaps may result in rates that can cause excessive crop injury. burndown ability when COC is added to the mix. Always read and follow pesticide labels. The following pages are the burndown section available in The Weed Control Guidelines for Ohio and Indiana. The Weed Control Guidelines for Ohio and Indiana are available on the web at <http://www.btny.purdue.edu/Pubs/WS/WS-16.pdf>. Always read before buying and follow pesticide labels when using pesticides. Tank-mix with: Most preplant and preemergence corn and soybean herbicides. •Apply in fall or spring for control of emerged annual broadleaf weeds, including ragweeds, lambsquarters, mustard species, marestail, prickly lettuce, and dandelion. Controls or suppresses perennial broadleaf weeds and legume sods (alfalfa, clover). •Mode of action: growth regulator. •2,4-D ester or amine can be applied preplant or preemergence to corn, but labels vary with regard to specific recommendations on timing of application. Labels for some products recommend application either 7 to 14 days before planting or 3 to 5 days after planting before the corn has emerged, while others specify application any time after planting. •Applications of 2,4-D around the time of planting can injure corn. This is more likely to occur in coarse-textured soils with low organic matter content, and when above-average rainfall and prolonged soil moisture occur within a week after planting. When applied preemeergence, 2,4-D amine is more likely to injure corn than 2,4-D ester. Labels for some products do not allow preplant or preemergence use of 2,4-D on light, sandy soils. Injury may be more severe when 2,4-D is applied with chloracetamide herbicides. •Many 2,4-D products are labeled for use in the spring prior to no-till soybean planting. OSU and Purdue University recommend the use of only 2,4-D low-volatile ester (LVE) or similar products for this application. 2,4-D amine products are more water soluble and may leach into the seed zone. For 2,4-D LVE, rates up to 0.5 lb active ingredient per acre must be applied at least 7 days before soybean planting. Application rates of more than 0.5 lb up to 1.0 lb active ingredient per acre generally must be applied at least 30 days before planting. Several 2,4- ester products, including E-99, Salvo, and Weedone 650, can be applied at a rate of 1.0 lb ai/A up to 15 days before planting. Do not apply more than 1 lb ai per acre. Only one spring application is allowed per year. •2,4-D is more effective than glyphosate for control of legume sods, marestail, dandelion, and prickly lettuce. For best control of alfalfa prior to corn planting, apply in combination with 1/2 pint of dicamba. If legume sods are cut prior to application of 2,4-D or 2,4-D plus dicamba, allow sufficient regrowth (4 to 6 inches) before herbicide application, or poor control may result. •When applied at rate of 1 lb ai/A in the fall, 2,4-D will control mustards, marestail, purple deadnettle, and many other broadleaf weeds. Add glyphosate for effective control of common chickweed, wild carrot, poison hemlock, cressleaf groundsel, Canada thistle, dandelion, and grasses. •Rage D-TECH is a premix of 2,4-D and carfentrazone (Aim) that results in more rapid herbicide injury to weeds, but does not improve control compared with 2,4-D alone. •Autumn (iodosulfuron-methyl) can be applied in fall before corn or soybeans planting, or early spring up to 30 days before corn planting, for control of winter annual weeds and dandelion. Most effective control occurs when mixed with glyphosate or 2,4-D and applied in the fall. Apply with 2,4-D for control of ALS- or glyphosate-resistant marestail. •Mode of action: ALS inhibitor. •Apply with crop oil concentrate (1% v/v) plus UAN (1.5 - 2 qts/A) or AMS (1.5 - 3 lbs/A). •Do not apply to frozen ground. •These products provide residual control of broadleaf weeds, and also help control many no-till weeds in mixtures with 2,4-D and glyphosate in preplant burndown treatments. •Mode of action: ALS inhibitor (Canopy EX); ALS inhibitor and photosynthesis inhibitor (Canopy DF); ALS inhibitor and PPO inhibitor (Valor XLT and Envive). •Canopy EX can be applied in fall or spring, with following restriction: rates of 2.2 oz or less should be applied at least 7 days before planting; rates of 2.2 to 3.3 oz should be applied at least 14 days before planting. Canopy DF can be applied in fall or spring (up to 45 days before planting). Envive and Valor XLT can be applied anytime in fall or spring, but must be applied before soybean emergence and no later than 3 days after planting. Do not apply to frozen or snow-covered ground. •Maximum rate on soils where the composite pH exceeds 7.0 (6.8 for Valor XLT): Canopy EX - 1.1 oz/A; Canopy DF - 2.25 oz/A; Valor XLT and Envive - 2.5 oz/A. •These products products can be applied to no-till or conservation tillage fields in the fall for burndown of existing vegetationand limited residual control into the following growing season. 2,4-D should be included with all fall-applied treatments. Do not apply to frozen ground. •Canopy EX controls common chickweed, but Canopy DF, Envive, and Valor XLT require the addition of glyphosate or Express for chickweed control. •Spring treatments should include 2,4-D ester and/or glyphosate for most effective control of emerged weeds. Glyphosate should be included if applied later than early April and where marestail, dandelion, and other perennials are present. •Apply with crop oil concentrate (1 gallon/100 gallons spray) for best control of emerged weeds, unless glyphosate is included in the treatment. •See descriptions of these products in the soybean herbicide section for additional information. Tank-mix with: Most preplant and preemergence corn herbicides. •Dicamba is sold under a number of trade names, including Banvel, Clarity, Sterling Blue, and Oracle. Dicamba is a translocated herbicide that can be applied before, during, or after no-till corn planting for control of emerged broadleaf weeds. •Use 1/2 pint on coarse-textured soils, and 1 pint on medium- or fine-textured soils containing at least 2 percent organic matter. •Dicamba is more effective than glyphosate for control of legume sods, especially when applied in combination with 2,4-D. When planting into a legume sod, apply dicamba after regrowth of 4 to 6 inches has occurred. •The addition of crop oil, surfactant, or fluid fertilizer may improve control of emerged weeds. Do not apply with crop oil when corn is more than 5 inches tall. •Corn should be planted at least 1 1/2 inches deep with good-seed furrow closure. May injure corn if recommended rates are exceeded, application is not uniform, or corn is planted too shallow. •The 1 pint rate provides limited residual control of small-seeded, annual broadleaf weeds. •Some dicamba products are labeled for application in the spring prior to soybean planting. The Clarity label allows soybeans to be planted 14 days after application of 8 oz/A, and 28 days after application of 16 oz/A, as long as one inch of rainfall has occurred between application and planting. •Dicamba plus atrazine is sold under a number of trade names, including Marksman, Sterling Plus, Banvel-K+atrazine, and Stratos. These products control most emerged annual broadleaf weeds, and suppress or control perennial broadleaf weeds, and provide some residual control of broadleaf weeds. •Mode of action: photosynthesis inhibitor (atrazine), growth regulator (dicamba). •Can be applied before, during, or after planting to emerged, actively growing weeds. Apply 2 pints on coarse soils with at least 2 percent organic matter, and 3 1/2 pints on medium- or fine-textured soils with at least 2 percent organic matter. •The addition of crop oil, surfactant, or fluid fertilizer may improve control of emerged weeds. Do not apply with crop oil after corn is 5 inches tall. •When planting into a legume sod, apply after regrowth of 4 to 6 inches has occurred. •Corn should be planted at least 1 1/2 inches deep with good seed-furrow closure. May injure corn if recommended rates are exceeded, application is not uniform, or corn is planted too shallow. •Expert is a premix of glyphosate, s-metolachlor (Dual II Magnum), and atrazine for burndown and residual control of grass and broadleaf weeds in no-till and conservation tillage corn. See descriptions of glyphosate and metolachlor/s-metolachlor plus atrazine for more information on these herbicides. •Mode of action: EPSP synthase inhibitor (glyphosate), photosynthesis inhibitor (atrazine), shoot meristem inhibitor (s-metolaachlor). •Use rates provide the equivalent of 0.4 to 0.75 lbs of glyphosate acid and 1.75 to 2.6 quarts/A of Bicep II Magnum. Use rate ranges from 2.5 to 3.75 qts/A on coarse-textured soils with less than 3% organic matter, and from 3 to 3.75 on all other soils. •Apply before, during, or after planting but before crop emergence. •Can be applied postemergence to glyphosate-resistant corn. Use water as the spray carrier for postemergence applications. •Can be applied in water or nitrogen fertilizer solutions (28% or 32% UAN only). Control of emerged weeds, especially perennial and large annual weeds, may be reduced if fertilizer is used as the carrier. •The addition of ammonium sulfate (17 lbs/100 gallons) can improve control of emerged annual weeds under cool or dry conditions. •Do not apply broadcast after the crop has emerged, unless the crop has resistance to glyphosate (Roundup Ready, Agrisure GT,etc). •To reduce the risk of glyphosate-resistant weed populations, OSU and Purdue University recommend application of glyphosate with 2,4-D ester wherever practical, including preplant applications to no-till corn and soybeans, in the summer/fall following wheat harvest, and in the fall for control of winter annuals and dandelion. An exception to this occurs when Canada thistle is the primary weed target for a fall application, in which case the 2,4-D ester should be omitted. •Glyphosate is a nonselective, translocated herbicide that controls emerged annual and perennial grass and broadleaf weeds, volunteer cereals, and grass cover crops. Table 23 contains a list of some currently available glyphosate products. Application rates, adjuvant recommendations, and other guidelines for use vary among glyphosate products, and users should consult labels and local product use guides for more specific information. The following comments are meant as general guidelines for the use of glyphosate. •Mode of action: EPSP synthase inhibitor. •The minimum glyphosate rate for most situations where weeds are no more than about 6 inches tall should be 0.75 lbs of glyphosate acid/A. Rates should be increased accordingly as weeds become taller. Pennsylvania smartweed, atriplex, giant ragweed, crabgrass, fall panicum, barnyardgrass, marestail, dandelion, and a number of winter annual weeds can be difficult to control, and should be as small as possible at the time of application. A mixture of glyphosate plus 2,4-D ester (0.5 lbs ai/A) will improve control of most broadleaf weeds. •Glyphosate resistance has developed in populations of marestail and common and giant ragweed in Ohio and Indiana, and some lambsquarters populations appear to have become less sensitive to glyphosate. To improve control of these populations and reduce the risk of resistance, apply a mixture of glyphosate plus 2,4-D ester at least 7 days before soybean planting, and include preemergence herbicides that have residual activity on these weeds (e.g. Valor, metribuzin, Gangster). Avoid use of herbicide programs in glyphosate-resistant crops consisting solely of multiple glyphosate applications. See the “Problem Weeds” section of this guide for additional information on management of these weeds. •For control of rye or overwintered wheat, apply in a spray volume of 10 gpa or less and use the appropriate rate for small grain size. Wheat should be treated before reaching a height of 18 inches. since it provides more effective alfalfa and perennial grass control, compared to application after harvest. Allow a minimum of 36 hours between application and harvest. Alfalfa should be harvested 3 to 7 days after application to avoid loss of quality and maximize perennial control. The preemergence herbicide program for corn should include atrazine at a rate of 1 1/4 to 1 1/2 quarts (or the equivalent amount in a premix). Postemergence application of Banvel or Banvel + 2,4-D may be required for complete control of alfalfa in the corn. •Glyphosate activity will be maximized when applied in water in a spray volume of 10 gpa or less. When mixing with residual herbicides, apply in 10 or more gallons of water or nitrogen fertilizer solution per acre. •Glyphosate activity on perennial and large annual weeds may be reduced when mixing with residual herbicides or applying in nitrogen fertilizer solution. Residual herbicides most likely to reduce activity include Bullet and MicroTech, and herbicides with contact activity on emerged weeds (Valor, metribuzin, atrazine, etc). Consult labels for rates and precautions when mixing with residual herbicides. •Recommendations for the use of ammonium sulfate (17 lbs/100 gallons of water) with glyphosate vary among products. Addition of ammonium sulfate may improve control, and is recommended under the following conditions: when mixing with residual corn or soybean herbicides, when air temperature is 55 degrees or less, or when hard or high pH water is used as the carrier. •Do not apply broadcast after the crop has emerged. •Gramoxone Inteon and Parazone contain paraquat, a nonselective contact herbicide that controls emerged annual grass and broadleaf weeds. Paraquat usually provides acceptable control of a rye cover, but is less effective than glyphosate for control of forage grasses such as orchardgrass and tall fescue. Paraquat is not effective for control of perennial broadleaf weeds, legume sods, perennial grass sods, or volunteer wheat although some suppression of these may occur. •Mode of action: cell membrane disruptor. •May not control marestail and prickly lettuce. May not control smartweed, giant ragweed, and fall panicum that are more than 4 to 6 inches tall. Control of these and many other weeds will be improved when paraquat is mixed with photosynthetic inhibitor herbicides (atrazine, metribuzin, and Lorox). The addition of 2,4-D will also improve control of many broadleaf weeds. •Application rates for Gramoxone Inteon: 2 to 2.5 pints for 1- to 3-inch weeds; 2.5 to 3 pints for 3- to 6-inch weeds; and 3 to 4 pints for weeds more than 6 inches tall. Application rates for Parazone: 1.3 to 1.7 pints for 1- to 3-inch weeds; 1.7 to 2 pints for 3- to 6-inch weeds; and 2 to 2.7 pints for weeds more than 6 inches tall. •Apply with crop oil concentrate (1 gallon/100 gallons spray) or nonionic surfactant (1 quart/100 gallons). Crop oil concentrate is the preferred spray adjuvant, especially when mixing with other herbicides. •When using flat fan nozzles spaced at 20 inches or less, apply in a spray volume of at least 10 gpa with a pressure of at least 30 psi. Increase spray volume to at least 15 to 20 gpa if weedsare more than 3 inches tall. For large spray equipment with flood type nozzles, use a spray volume of at least 20 gpa with a pressure of at least 30 psi. •Allow 30 minutes between application and rainfall. •Do not apply with suspension or high-phosphate liquid fertilizers. •Harmony Extra and Express can be applied in the fall and/or spring before planting corn or soybeans (at least 14 days before planting) for control of wild garlic and other broadleaf weeds. •Harmony Extra is a premix of thifensulfuron (Harmony GT) plus tribenuron-methyl (Express) that controls wild garlic and annual broadleaf weeds, including lambsquarters, mustard species, Pennsylvania smartweed, field pennycress, and shepherd’s purse. Express controls purple deadnettle, chickweed, and field pennycress, and provides partial control of shepherd’s-purse and other mustard species. Apply with 2,4-D ester for best results. •Basis is a premix of rimsulfuron plus thifensulfuron (Harmony GT) that can be applied in the fall (0.33 to 0.5 oz/A) or spring (0.3 to 1 oz/A) before planting corn for control of winter annual weeds. When mixed with 2,4-D ester, fall-applied Basis controls chickweed, deadnettle, henbit, dandelion, mustards. and other winter weeds. Spring applications with other corn herbicides (2,4-D ester, atrazine) before corn planting can provide burndown of small annual grass and broadleaf weeds, and several weeks of residual control of foxtails, lambsquarters, and pigweeds. A mixture of Basis plus atrazine has been one of the most effective burndown treatments for no-till corn in OSU research. Apply with crop oil concentrate (1%, v/v) and ammonium nitrogen fertilizer. Can be mixed with other herbicides approved for these uses. Do not apply in the fall or spring before soybean planting. •To control wild garlic, apply 0.5 to 0.6 ounce or Harmony Extra when garlic plants are less than 12 inches tall with 2 to 4 inches of new growth. Control will be better if applied during warm weather (60 F or more) to actively growing garlic plants. Thorough spray coverage of garlic plants is essential. •Apply with crop oil concentrate (1% v/v) or nonionic surfactant (0.25% v/v). Use flat fan or low-volume flood nozzles for best results. Tank-mix with: Atrazine, simazine, glyphosate, Gramoxone Inteon. •Lumax and Lexar are premixes of atrazine plus s-metolachlor (Dual II Magnum) plus mesotrione (Callisto). A use rate of Lexar contains a higher amount of atrazine per acre, compared with Lumax, and a lower amount of s-metolachlor. •Mode of action: photsynthesis inhibitor (atrazine); shoot meristem inhibitor (s-metolachlor); pigment inhibitor (mesotrione). •Lexar and Lumax have been among the most effective preplant burndown treatments for no-till corn in OSU and Purdue University research, for control of dandelion and most winter annual weeds. These products also provide residual control of annual grass and broadleaf weeds. See descriptions of these products in the corn herbicide section for more information. •Weedmaster/Brash is a premix of 2,4-D amine plus dicamba for control of emerged weeds in the fall after corn or soybean harvest, or in the summer or fall after wheat harvest. Similar products are available from other manufacturers. •Controls mustards, marestail, cressleaf groundsel, dandelion and some other winter annual weeds, but is weak on purple deadnettle and common chickweed. •Apply when annual weeds are less than 6 inches tall, when biennials are in the rosette stage, and when perennials are at least 6 inches tall or in the bud to bloom stage. •Any crop can be planted 120 days after application of rates up to 6 pints per acre. •Can be applied prior to wheat planting, but allow an additional 10 days between application and planting for each pint applied (e.g. for a 2 pint rate allow 20 days). •The standard adjuvant recommendation is 2 to 4 pints of nonionic surfactant per 100 gallons of spray solution. Brad Joern (765) 494-9767 bjoern@purdue.edu Soil Fertility, Waste Mgmt. Bernie Engel (765) 494-1162 engelb@purdue.edu Interim Head, Dept. of Ag. & Bio. Engr. Daniel Ess (765) 496-3977 ess@purdue.edu Precision Ag., Ag System Mgmt.